Now a days, the broadband Internet is not that costly. We can get unlimited Internet plans with Wi-Fi at home, through broadband connections. But still, mobile data is required in the phone as we cannot be at home all the time. Sometimes we need fast Mobile Internet for some specific need, and we don’t want to spend much on that. Different companies provides different small data plans, but those are not sufficient or there will be no speed at all, say for 2G. Please note that this is a trick tried by many people in different regions. Try at your own risk. We are not responsible for any talktime/data loss or SIM blockage in case the trick doesn’t work for you. One you have activated the above pack, you need to activate a small pack of Rs.9, which gives 25MB 3G/4G data for one day. 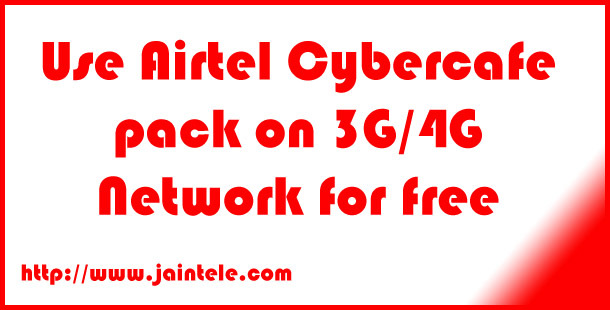 You need to activate this pack in order to trick Airtel to use the 2G Cybercafe pack on 3G/4G data. To activate this pack, dial the USSD code *567# and then select option 4 for 3G/4G. Then option 1 for the Rs.9 3G/4G pack. One you have activated both plans, Switch off your phone and switch it on again. Alternatively, you can turn on Airplane mode and turn it back off. Now put your phone on 3G/4G network, if it is not already and turn on your mobile data. Done!! Now enjoy unlimited 3G/4G data on your phone for next one hour. If you are facing any issue in performing the steps above, feel free to put comments. We’ll be happy to help you as soon as possible. Also, comment whether this trick is working for you or not, with your area/state name. It will be useful for other people as well.